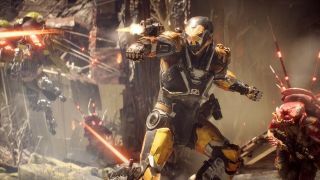 Anthem update 1.0.4 is now live with dozens of welcome gear and loot changes. The headlining acts are the new Legendary Missions, which are basically replayable versions of story missions with higher difficulties and better loot. Elysian Caches have also been added. These are found at the end of Strongholds and can be opened using Elysian Keys obtained from daily challenges. Elysian Caches only yield vanity items and crafting materials, but the good news is you'll never receive duplicate items. Other, non-Elysian chests were also buffed and may now drop additional items in Strongholds, freeplay, and missions. Apex creatures like Titans got a similar bump to their drop table. And on the heels of the recent Grandmaster 2 and 3 loot buff, all Grandmaster difficulty Stronghold bosses "will now drop more loot with a chance at additional Masterwork and Legendary items." "The Forge can now be accessed via the main menu while you’re in Ft. Tarsis or the Launch Bay." "There is no longer a loading screen when entering the Forge." Firstly, anything that takes loading screens out of Anthem is great news. Secondly, thank the lord. Trudging back to the Forge every time you wanted to inspect a new piece of gear or tinker with your loadout was such a drag. It's so nice to be able to access it from anywhere in the hubs. You can read the full list of buffs and changes here. The hope is that these balance changes will inspire new loadouts, and that the recent loot changes will help players build those loadouts. Now we just need some new content where players can put those loadouts to use. Chests got a nice buff, so here's a map of Anthem treasure chests to look out for.